Frome Health Centre fully operating thanks to the Friends! THE NEW £10.5m Frome Health Centre was officially opened by Angela Yeoman OBE earlier this month. The centre has of course actually been open to patients now for nearly eight months and as each week passes, the new operating theatre is able to carry out more treatments and procedures. However, the very fact that Frome now has its own state of the art operating theatre capable of carrying out a whole range of surgery, is entirely down to The Friends of Frome Hospital who have provided the sum of £65,000 to have it properly equipped. 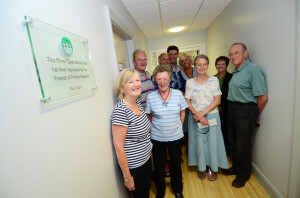 At a ceremony attended by both the Friends of Frome Hospital and representatives from the Frome Medical Practice, the operating theatre was officially opened and a commemorative plaque unveiled. Peter Smith is the chairman of Friends of Frome Hospital. He said, “‘Having fought for the new hospital over many years one of our primary objectives now is to do all we can to ensure that the people of Frome and the surrounding area can be treated in Frome and avoid having to travel to Bath, Shepton or Yeovil for treatment. For financial reasons a minor operations theatre was dropped from the original plans for the combined hospital and health centre and the completion of the superb new medical centre provides the opportunity to reinstate it.